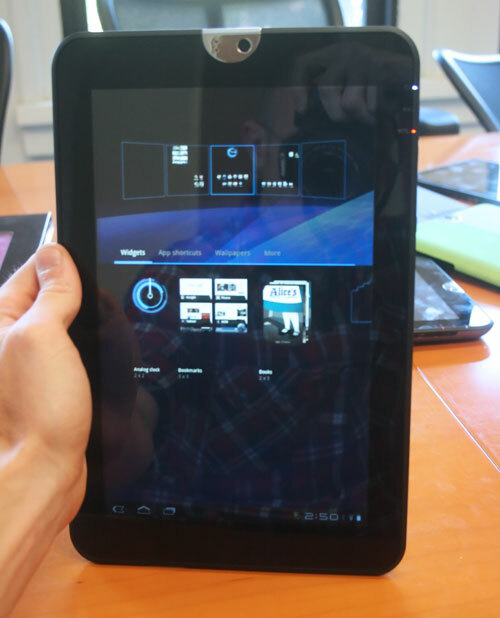 Toshiba recently announced a slew of details about its upcoming Android 3.1 Honeycomb tablet, dubbed the Thrive. The device won’t be available until July, but we had a chance to get some hands-on time with the device that aims to rival the army of tablets flooding the market, including Apple’s pack-leading iPad. For starters, the Thrive measures in at 10.1-inches – slightly larger than the iPad 2 and the same size as Samsung’s Galaxy Tab. That said, the Thrive is noticeably thicker, about 0.27 inches thicker. And at 1.6 pounds, it weighs about 0.3 pounds more than either the iPad 2 (1.33 pounds), or the Galaxy Tab (1.25 pounds). Toshiba justifies the extra bulk with other offerings – like full-sized USB 2.0 and HDMI ports – that are a definite plus over the mini versions squeezed into other devices. The company hopes customers will think of Thrive as the “most useable tablet” – not the thinnest or the lightest. Part of Thrive’s weight illusion is due to the tablet’s weight distribution, according to Toshiba. It also has to do with the ridged rubber backplate of the Thrive, which makes the device easy to grip comfortably, without feeling like it’s constantly about to slip out of the fingers, as do some other tablets in this size range. The Thrive ships with a black backplate, which is easily removable. This enables users to quickly access the battery pack, and swap it out for another. A replacement Thrive battery will sell for about $90. Toshiba also hopes the removable backplate will allow the Thrive to appeal to customers looking for a more customizable tablet, as the company will offer five different colored backplates, which will sell for $19.99. In addition to the full-size USB and HDMI ports, the Thrive also sports a full-sized SD card reader, micro-USB jacks, a 3.5mm headphone port and a docking port for routing out video and audio from the device to its accessories. Thrive also comes loaded with a set of solid speakers, which are helped out by audio-enhancing software that comes pre-loaded in the device. While the enhancements did improve Thrive’s sound quality, it seemed superfluous to make them option. Why not just make the sound better from the start? The Thrive’s 16:10 screen sports 1280 x 800 resolution, and Toshiba boasts its IPS-like wide-angle viewing capabilities. At indirect viewing angles, in bright indoor light, the screen was still easily viewable, though it didn’t have quite the crispness of an iPad 2 display. Another welcome addition is the ambient light sensor, which automatically adjusts the screen’s brightness when the lighting changes – a feature found in many other tablets. Mercifully, the Thrive’s software package is more or less standard Android Honeycomb, and lacks the widgets and pesky skins with which some companies choose to clutter their devices. Toshiba does include some useful apps, like a customer File Manager that was intuitive to use, and makes finding, opening and moving files around on that tablet a breeze. Apps open and run with ease, and scrolling from screen to screen was smooth as homemade butter – all of which is due to the Nvidia’s heavy-lifting1GHz Tegra 2 dual-core processor and 1GB of RAM. Critics of the Thrive will likely point to its complete lack of 3G capabilities. But since most people are shown to use their tablets at home, the Wi-Fi-only specs of the Thrive are likely more than sufficient for the average user. What nobody can hate on, however, is the price. The Thrive will come in three models: an 8GB version for $429; 16GB for $479; and a 32GB for $579. That’s cheaper than most comparable devices (the 16GB Wi-Fi-only iPad 2 retails for $499, for instance), and the relative inexpensiveness of the Thrive could prove its saving grace. Toshiba says the Thrive is part of its “continuous computing initiative,” as they call it, which means the table is intended to be a secondary device that compliments other computers. And that seems about right to us. The relative beefiness of the Thrive will turn away consumers looking for the lightest, thinnest thing they can get their hands on. But with a fair price and respectable specs, the Thrive is a solid device for the average consumer, and is on-par with the Xoom. Will it knock Apple off its tablet throne? Not a chance. It could, however, turn your mom into a Android fanatic, which, for some of us, is worth more than the Thrive’s weight in gold.